The Price Is Right, one of America’s favorite game shows, can be used to illustrate numerous economic concepts, including optimal bidding strategies, risk preference, and search theory. 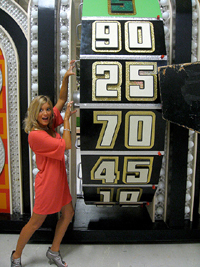 Twice an episode, one of the most purely mathematical portions of the show occurs, when contestants take their turn to spin "the big wheel." In addition to being a crucial prelude to the Showcase Showdown, it is a convenient hands-on application of using probability theory to derive an optimal decision-making rule. The wheel contains 20 equally sized panels corresponding to values between $0.05 and $1.00. Three contestants reach the wheel during each half of the show. The winning contestant is the one whose total score comes closest to a dollar without going over; as a prize, they earn one of the two spots in the show’s final round, the Showcase Showdown. One at a time, each contestant spins the wheel to get an initial value. The player then has the option to keep his current value or spin one more time. If he spins again, his final score is the sum of his two spins. Any contestant that goes over $1.00 automatically loses. In the event that two or three contestants are tied with the same final value, they each spin the wheel once, highest score winning. Consider three contestants: Mr. 1 will spin first, Ms. 2 will spin second, and Mrs. 3 will spin last. Assuming that all of the contestants aim to maximize their chances of winning a spot in the Showcase Showdown, we set out to derive the optimal strategy for Mr. 1. In order to determine his optimal strategy, we will make three simplifying assumptions. First, each result from spinning the wheel is an independently determined random outcome, where each panel is equally likely to be spun. Next, in the event of ties, each tied player has an equal chance of winning (either 50% for a two-person tie or 33% for a three-person tie). Finally, the show pays a $1,000 bonus prize (and a chance to earn even more money on a “bonus spin”) to any contestant scoring exactly $1.00 on one spin or a combination of two spins. However, we will not consider these cash prizes as an extra incentive to spin again since they have no bearing on which contestant goes to the Showcase Showdown. We focus only on the decision-making rule that gives Mr. 1 the best chance to make the final round. The only decision a player makes during the game is whether to spin again or stop after the first. Clearly this decision will depend on the value of the first spin—the higher the first spin, the more reasonable it is to stop. To explain fully how a player maximizes his chance of reaching the Showcase Showdown, we solved for a cutoff value: the lowest initial spin value where Mr. 1 has a higher probability of winning by staying rather than spinning again. In order to find the optimal stopping value for Mr. 1, we first calculated the probability that Mr. 1 wins the game (either outright or through the tie-breaker) if he stays with any initial spin. This gives 20 different probabilities of winning the game if Mr. 1 stays, one for each possible spin value. For example, if Mr. 1 stops with $0.55, he stands a 7.4% chance of winning whereas if he stops with $1.00, he has an 86.2% of going to the Showcase Showdown. Next, we calculated the odds that Mr. 1 wins if he spins again. To do this, we looked at his likelihood of winning for each possible score after his second spin is added to his first. Mr. 1’s optimal cutoff in this game is $0.70, where stopping with a spin of $0.70 gives a 19.8% chance of winning, but spinning again gives only a 15.8% chance of winning. At any initial spin less than $0.70, Mr. 1 has a better chance of winning by spinning again. For example, after a first spin of $0.65, Mr. 1 has a 14.6% chance of winning if he stops and a 16.8% chance of winning by spinning again. By a similar method, we find that in the case where Mr. 1 goes over $1.00, the stopping rule that maximizes Ms. 2’s chances of winning is to stop with any initial spin of $0.55 or more. 1. How would you expect the stopping values to change if a fourth player were added to this game? What would the effect on the stopping values be if we factor in the bonus prize for a total score of exactly $1.00? 2. Given that the stopping values decrease as fewer players remain in the game, do you expect a player with a certain spot in the order to have an advantage? If so, which one? 3. Deal or No Deal is an example of another game show where a contestant’s optimal strategy could be described by a stopping rule. Can you think of other games where this type of strategy can be applied? When you pay ransom to a hostage-taking pirate, traditional economic theory suggests that you increase the returns to piracy, encouraging more of it. If you kill a hostage-taking pirate, you increase the cost of piracy, which should discourage would-be pirates from taking to the seas. The response by the Somali pirates to the U.S. Navy's recent killing of three pirates has been just the opposite though. These gangs say they are now devoted to revenge-taking over more ships and taking more hostages than ever. The cost of doing business has risen, and yet they want to do more of this business than ever. Why do you think this is? 1. In order to quickly obtain large ransoms, pirates must signal a credible threat to cargo ship owners. How might this credibility issue play into the pirates' response to the actions of the U.S. government? 2. The pirates killed by U.S. Navy snipers were holding an American captain of an American boat with an American crew. Might governments respond differently in situations involving multi-national crews? 3. The pirates who were killed were likely just henchmen with little power in the criminal organization. Did the "cost of doing business" really rise very much for the pirates running the organization? 4. In what ways does the government provision of naval security in international waters resemble a public good? Might the current allocation of security (both private and public) in international waters be inefficiently low? 5. From the standpoint of ransom maximization for a small individual gang of pirates, what is the optimal amount of piracy? What is the ransom maximizing strategy if the piracy off the Somali coast is coordinated by a cartel of gang lords? A few days ago, Moody's Investors Service announced that its outlook for the entire U.S. local government tax-backed and related ratings sector is negative. This is newsworthy not only for municipal bond investors but also for anyone following the U.S. recession. It marks the first time that Moody's issued an outlook on this entire sector, although it has issued ratings on the sector since 1914. Moody's Investors Service is one of the leading issuers of credit ratings. Investors use these ratings to gauge the risks of investing in debt assets. So, one might conclude that the analysts at Moody's are remarkably pessimistic about the impact that recessionary economic conditions will have on the ability of local governments in the U.S. to meet their debt obligations. This means that the risk of defaults on these debts has risen. However, Moody's hedged its announcement by mentioning that credit pressures will vary significantly across locales due to differences in economic conditions, property assessment methods, and authority to raise revenue. The varying economic conditions can largely be explained by localities' exposure to industries hit particularly hard by the recession. These include real estate development, auto manufacturing, financial services, tourism, gaming, and general manufacturing. Differences in property tax systems will play a major role. Moody's report shows evidence that about 72% of local government tax revenue comes from property taxes. The bursting of the housing market bubble will bring declines in property tax revenue for most local governments because of falling home values. Several of these governments might have the authority to increase property, sales, or income tax rates to raise revenue. Whether the elected officials running these localities are willing to do this is an open question. Moody's points out that taxpayers are worried about their own financial conditions and are highly resistant to increases in local taxes. Raising taxes in this environment will be unusually difficult for locally elected officials. 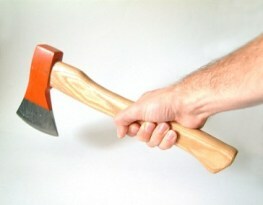 Cutting spending during the economic crisis will not be an attractive option either. In part, this is because many of these governments may face service mandates that prevent them from reducing service-related expenditures. An example of a service mandate is that a state government may mandate that local governments provide health services for the poor. Moody's analysts also reported that the demand for improved government services will make it that much more difficult for these governments to sustain healthy finances. Local officials may find that it is more palatable to default on their bonds rather than raise taxes or cut spending. 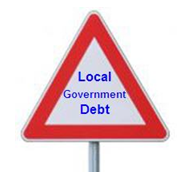 The credit crunch is also having a direct impact on local government finance. Moody's report states that access to credit will be more expensive for these governments than it had been in recent years. Moody's negative outlook announcement surely caused investors to demand greater yields on the municipal bonds trading in the credit markets. The company also warned that some localities are in such dire straits that they may be completely shut out of the credit markets. Yet, the situation ought to be tenable for numerous governments. For instance, some well-managed localities increased their reserves during the boom years and were prudent with the funds generated during the real estate bubble. A simple example from portfolio theory can help show why investors may still be willing to buy the bonds of a cross-section of municipalities. Suppose that a bond investor purchases three one-year bonds with different expected returns and probabilities of default. For simplicity, we'll assume that the investor is risk-neutral and the bonds pay nothing in the event of default. Bond A has a 25% probability of default this year but pays a coupon of 15% if it avoids default. Bond B has a 50% probability of default this year but pays a coupon of 20% if it avoids default. Bond C has a 75% probability of default this year but pays a coupon of 30% if it avoids default. Let's also assume that all the bonds have a face value of $100 each. So, on average, an investor would be willing to pay less than 60% of face value on these bonds to make a positive expected return. This example was purposefully simple, but from it you can see the advantage of diversification and the problem of gauging risk. If the probabilities of default end up being higher than estimated, the investor might lose money but will only lose all his money in the rare case that all bond issuers default. Yet, if the probabilities of default are lower than estimated, the investor might earn a high rate of return. 1. How does the bond portfolio example relate to the impact that mortgage-backed securities had on financial institutions? What must have happened to their default rates for them to become known as "toxic assets"? 2. If you had a large sum of money that you had to use for investment purposes, would you put together a portfolio of U.S. local government debt? If yes, why? If not, explain what your preferred investment would be. 3. Besides an economic recovery, what changes, if any, do you think are needed for local governments to avoid defaults in the future? How feasible are your proposed changes? Yesterday morning on a local radio station, a few callers discussed a silly idea. 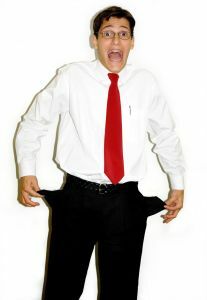 The question posed to listeners was this: "Should there be a law against anyone earning over $1 million per year?" One caller talked about the celebrity Kim Kardashian, and how it is not right that she earns so much money. That is absurd. The market is rewarding Kim because of her looks, her connections, and because in recent years her public persona has been well-managed. If companies want to pay her ridiculous amounts of money for her various "talents" because people enjoy being entertained by her, then so be it. It might not be fair, but neither is life. On the bright side, we have a progressive income tax system that will tax such extravagant incomes at higher rates than the rates faced by ordinary Americans. A much better idea would be to raise marginal income tax rates on the highest tax brackets to help limit our budget deficits and get a fair amount of tax revenue from those whom our market system has allowed to earn enormous amounts of income in our nation. Yet, how could economists ridicule a ban on excessive income when they support President Obama's limits on executive pay for firms that seek government assistance? The reason is that such firms were mismanaged, and as a result, they got pummeled by the market, forcing them to sheepishly seek government bailout funds. In this situation, executive salary caps are a brilliant proposal. If the firms do not like the caps, they could try getting bailed out by the market, but they will find that the market will most likely not come to their rescue. The market system will allow the firms to go bankrupt because of their poor performance. That is what the market system does to firms that perform poorly. Obama's limit is set at "only" $500,000 per year and lasts until the bailout funds are fully repaid by the firm. The argument against the salary caps proposed by Obama is that these firms will lose good executives because they can be paid more elsewhere. But is this necessarily a problem? There are undoubtedly many capable people with better understanding of risk management and liquidity who would be happy to work for these firms for $500,000 per year. If the firms find that they cannot retain the best executives, then they will find themselves with a greater incentive to refund the taxpayer money that much sooner. If the executives who are running these firms want to earn more than $500,000 per year, they will have to get their firms back in shape and earn enough profit to repay the bailout money. An argument can be made that shareholders can oust poorly performing executives and limit executive pay by changing a corporation's board of directors. This argument is a diversion, as can be seen in an article named Shareholder Power from the Christian Science Monitor. Let the Kim Kardashians of the financial sector go seek out new firms to mismanage! 1. Do you agree with this author's viewpoint about bans on enormous salaries? How about his viewpoint on Obama's executive pay cap plan? Is there inconsistency in his views? Is there inconsistency in yours? 2. How do you feel about America's progressive income tax system? If you were in control of the federal government, what would you do to change it, if anything? 3. What do you think about the concept that government should stay out of the free enterprise system? Do you believe that government involvement has made the global financial crisis worse, or has it helped moderate its severity? 4. Suppose that the U.S. did enact a law against anyone earning over $1 million per year. What would the corporate CEOs, celebrities, athletes, and other top earners do in response? Would they leave the country? What other complications might arise from such a law?